Drip marketing email sequences are a great way to drive new business for your company. Whether sending educational newsletters, new product announcements, one time offers or any immediate call-to-actions, email marketing is a great way to reach your current customers and consistently communicate with them. Email marketing is one of the most effective ways to generate brand awareness, customer acquisition, conversion and retention. If you are a company with hundreds or thousands of active customers or prospects, it can be difficult to effectively communicate with all of them over the phone or in person. Communicating with your customers is an important method of enhancing customer relationships, and email marketing is one the best ways to keep the communication channels open between you and your customers. You need to be in constant communication with your prospects and your active customer list because although they may not be ready to make a purchase or take action right away, you can continue an ongoing relationship with customers via email. This active communication allows you to provide valuable updates, send useful information that customers are interested in and incentivizes them to continue to subscribe to receive this information and unique offers. 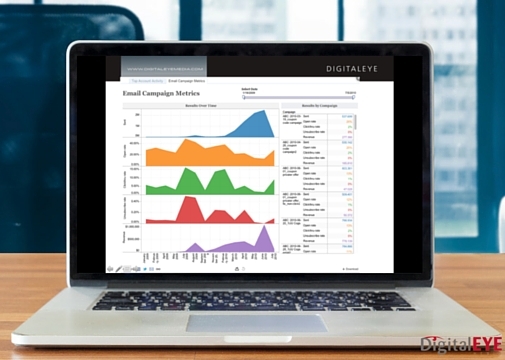 Digital EYE Media campaign experts guide you through best practices for streamlining your email marketing campaigns including database integration and automating your content delivery. We’ll also provide you with a deliverability audit and a data-driven campaign analysis that identifies what’s working, and what needs to be refined to optimize your ongoing email marketing initiatives and increase your ROI. One of the most important proprietary items that your company can own is prospect and customer emails. The more accurate the segmentation of your customer database is based on client information and purchase behavior the more valuable this customer list is. Do you ever stop and wonder what made FB or Instagram worth billions of dollars pre-revenue? The company value is in the data from their users, the detailed information they have about these users and at that time the future opportunities to effectively market highly targeted ads to these people based on demographics and things they said they like in their profile. One lesson we try to take from Facebook is that you want to provide your customers new opportunities to tell you more about themselves, whether it’s purchase behavior so you learn their taste, gender and age range so you can display unique fashion trends, location or life events, allowing us to recommend relevant products other users in those same interest groups previously purchased, and essentially empower you to become a better product or service provider to those customers. Digital EYE Media offers your company a full range of email campaign services and solutions designed to deliver business results. Email Content Creation (or Campaign Copywriting) We provide high-quality, targeted and engaging copywriting and messaging that will establish your brand’s credibility with your customers and with your prospects. Highly Targeted List Building and Management We’ll help you segment your lists in order to target your key prospects using automated list management with triggers, to automatically convert leads into opportunities once they open a specific email, send a follow up email or remove inactive leads. Email Template Design Our team offers professionally designed custom email templates that are optimized for all screen sizes. Email Automation We develop automated campaigns to qualify your leads and follow up with prospects automatically using autoresponders and a series of targeted and personalized email messages at intervals defined by you. Testing, Tracking & Reporting Optimize your email click through rates using split testing, or solicit and track feedback with surveys. All your email marketing efforts are tracked and measured to identify successes and presented in a detailed campaign report. Tracking – Post click tracking allows you to get a better insight on what happens after your email subscribers clicked on the link in your email and landed on your website. Segmentation – Segmenting allows you to send the same email blast to different sets of people or two completely different emails depending on your audience which gives you the chance to see which one performs better. Reporting – Our reporting includes integration with Google analytics, giving you the ability to track and view your customer’s behavior from email right through to your company website and conversion page. Our full campaign provides a detailed analysis of open rates, click throughs and opt-ins, as well as recommendations for improvements on your next campaign. 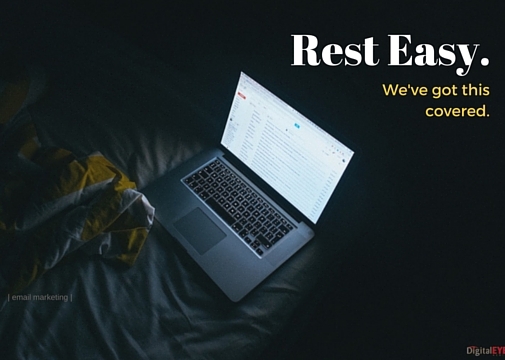 Truly, failing to invest in email marketing is failing to invest in your business! 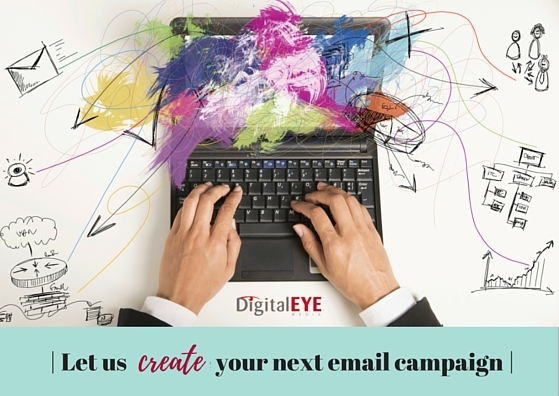 Find out how Digital EYE Media can help optimize your email marketing campaigns for increased conversions! Call us today!